General Information: Technically a fruit, eggplant belongs to the nightshade family (Solanaceae), akin to the potato, tomato as well as the tomatillo and chayote. Early varieties of eggplant were smaller and white, resembling eggs, hence the name. 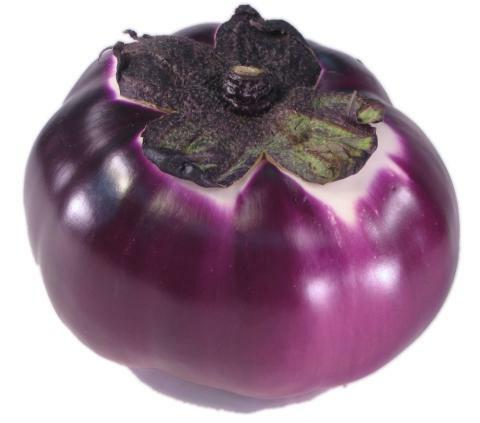 History: The eggplant is native to India and Pakistan and was first domesticated over 4000 years ago. The fruit was introduced to China around 500 B.C. The Chinese hybridized their own varieties of different shaped and colored eggplants. The migration of the eggplant continued in the 9 - 12th centuries to the Middle East and westward to Egypt. The moors introduced the eggplant to the Spaniards and the fruit became popular all over Europe. The Spaniards thought the eggplant was an aphrodisiac and referred to as "Berengenas" or "The Apple of Love". This of course added greatly to the popularity of the unusual fruit. The love affair with the eggplant took a downward turn in Northern Europe where Albert of Cologne referred to the fruit as "Mala Insana" or "Mad Apples" (a take off of the Italian name "melanzana"). The fruit was thought to cause insanity if it was eaten. It seems the commoners got over that and by the 1600's several varieties migrated from Naples to Germany. While the Spaniards were traveling the globe they took the eggplant to South America around 1650. It was Thomas Jefferson (well known for his promotion of horticulture) who introduced them to the United States in 1806 after receiving an eggplant from a friend in France.